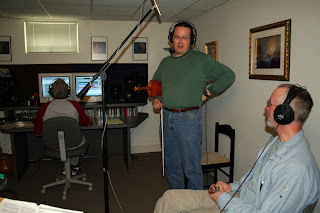 Aisling Irish Traditional Music: Aisling back in the studio at last! It's been about 10 years since we've done a CD project and we're very excited to back in the studio. 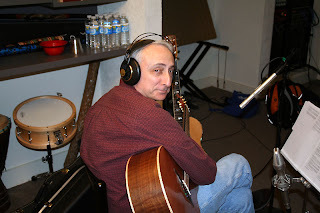 We're working with Craig Markley at Lone Raven Studio. The name of the band's CD will be "The Pilgrim's Road." 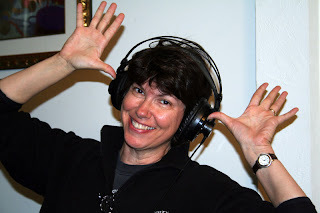 This is a tune that I composed and we have an awesome photo to go with the set that includes another of my tunes called, "Dancing on the Headstones." 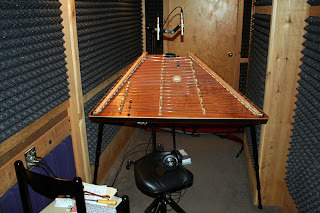 Here's my dulcimer - - in isolation out in the padded hallway. Everyone else is in the other room. I always knew I'd find myself in a padded room sometime in my life. . .
Craig said, "yes, of course you do." 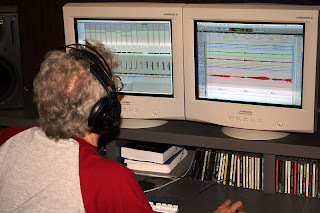 We're working with a click track and recording each of our parts in isolation. 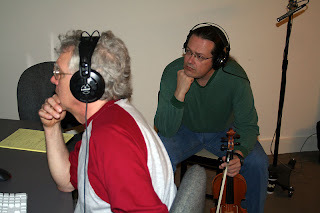 It's really neat to hear how the arrangement builds as we add each of our instruments onto the different tracks. Here's Craig Markley working his magic with his software. After each track is laid down we listen to it and decide on whether there are any problem spots and what to do to fix it. Sometimes it's recording a new patch over the mistake and other times Craig can grab something from another area and patch it in. That's the big advantage of working to a click track. We did most of three tracks today. If the rest of the project builds like this one started, we're going to be very happy with our recording.